Mealy bugs are slow-moving insects which are usually covered with a mealy or waxy secretion which may extend into a series of filaments on the sides and end of the body. Mealy bugs are small insects, ranging from 1/50 to 1/3 inch. Females lay masses of eggs or may give birth to living young. Eggs hatch in about two weeks and young females will mature in six to eight weeks. Young, immature mealy bugs are very mobile and are called crawlers. Males are short-lived and rarely seen. Mealy bugs excrete honeydew, a sugary substance that serves a medium for sooty mold, a dark colored fungus that causes no damage to the plant, but greatly detracts from the beauty of the leaves. 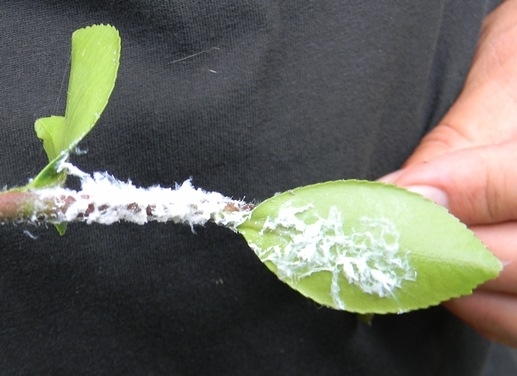 Feeding by mealy bugs may also cause distorted leaf growth or premature leaf drop. Two species of mealy bug which attack camellias are the Citrus mealy bug, Planococcus citri, and the Long-tailed mealy bug, Pseudococcus longispinus. Both of these are common in greenhouses and out-of-doors where temperatures are quite warm. Mealy bugs can be controlled through the use of light oil sprays or insecticidal sprays. A strong spray of water will often wash them off the plant. These are not common pests of camellia and therefore are considered relatively unimportant.